Today Marcie covers some basic food truck driver safety tips that everyone that drives a food truck should be aware of. Not only do these rolling bistros handle differently than most privately owned vehicles, they are the life blood of a food truck business. Every time your truck is in the shop means you are not able to hit the streets to sell your food truck fare. Just when you thought you were having a bad day . . . Whenever one of the girls in the office starts to complain, we have a little saying to remind us of how lucky we are: “If you think you’re having a bad day . . . just go out to the shop!” Our mechanics are definitely some of the hardest working people around, and new challenges are always just around the corner. Every once in a while I get the opportunity to see them in action – usually when I’m dispatched for an accident investigation. I have to admit . . . when I first arrived at the scene of this accident, I was very tempted to just keep on driving. A few months before, those colorful “Look at me!” decals seemed like a really good idea when we decided to install our first full wrap, but now . . . not so much. Luckily, our mechanic arrived quickly, and I was hoping he would be able to get us out of there just as quick. He exited the tow truck . . . I looked at him . . . he looked at me . . . I looked at him. We knew we were supposed to do something, but what? After years of investigating food truck accidents, this was a new predicament for both of us, so I decided I would just start taking my photos. Thankfully, everyone was alright, and after speaking to the driver, I learned that she was “just driving along” when she hit a slick patch, and the truck “went flying”. Since I was pretty sure this was not 100% exactly what happened, I knew I was going to have to find a way to dig deeper. While the mechnic tried to figure out how to get her down and bring her home, I went over to speak with the special investigator. It turns out that speed was a huge factor (you don’t say!) – he determined that she had to be going more than 70 miles-per-hour at the time of the accident. In fact, in his opinion, if she’d been traveling only a few miles-per-hour faster, the truck would’ve rolled right over the median (instead of straddling it ever so gracefully), heading straight into oncoming traffic. In light of the fact that she was not wearing her seatbelt, he was certain that (in this scenario), not only would the driver have been killed, but it is very likely that there would have been more serious injuries. So how did this accident happen? Experienced driver . . . check! Well-maintained equipment (with fully-functioning brakes and seatbelts) . . . check! Active participation in a safety program . . . check! No more stops for the rest of the day . . . check! Actually, we can all guess how it happened . . . she was obviously speeding, and the truck hydroplaned, spun around a few times, triple toe loop, etc. But the real question is “why?” In my experience, the answer is usually that the driver was distracted. Whether she was worried about picking her kids up from school, calculating how much gas to put in her tank, stressing about the business she lost in the rain, or even talking on the phone, the reality is that food truck operators can be some of the most distracted drivers around. But it doesn’t have to be that way. 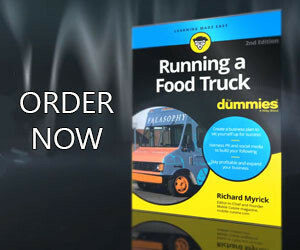 On top of the usual distractions, it is critical for food truck operators to realize that every time they step into their truck, it’s a different truck. The weight is constantly shifting from loading product, melting ice, washing dishes, etc. For this reason alone, operating your vehicle demands your full attention, especially when road or weather conditions are a factor. Every time you take the wheel, you have the power to decide what’s important, and make a priority of driving safely. So eliminate all distractions, adjust your safety cushion, focus your attention – and remember . . . you might think you’re having a bad day, but it can always get much worse!